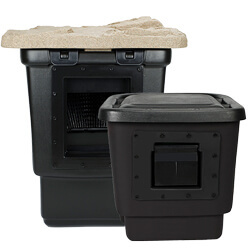 Aquascape Skimmers These professional-grade skimmers include patented features that make installation a breeze with components designed to make maintenance effortless. Available units can handle ponds from 100 sq. ft. up to 1,000 sq. ft.